A dish holds balls of soumbala in its final, ready-to-use form. Photo by Christian Costeaux.Many cuisines have developed fermented protein sauces that provide flavor and nutrients year round: soy sauce and fish sauce have even become staples in kitchens internationally. In West Africa the favored item is soumbala, a labor-intensive preserved bean paste. In West African cuisine, soumbala has been as prevalent as soy sauce is in East Asian cuisine, seasoning meat, vegetables, and soups. In the past, when there was nothing else to eat, soumbala was eaten with grains and provided essential nutrients. Today, however, due to international subsidies and industrial production of substitutes, soumbala is disappearing from traditional dishes. The African locust bean tree, indigenous to West Africa, grows from Uganda north to Chad and west all the way to Senegal. These trees produce orange and red spherical flowers, which develop long pods , each containing up to 30 protein-rich seeds. One reason for the pods’ appeal across West Africa may be the tree’s resilience: it can withstand droughts and grows in conditions ranging from tropical forest to rocky slopes and wooded farmlands. 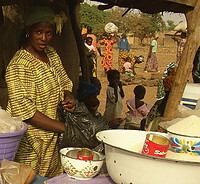 This woman in a marketplace is selling soumbala along with other traditional foods. Photo by Christian Costeaux.While the pods contain a sweet, edible pulp, it’s the hard seeds embedded in the pulp that provide the distinctive flavor of West African cuisine. When the seeds are fermented they produce the pungent seasoning that is known as soumbala (alternately soumbara) in Mali, nététou in Senegal, and dadawa in Nigeria, among other regional names. The pods mature during the dry season and can be collected from April to June. Before they can be used, the pods require a great deal of processing: they must be shelled, the pulp removed and reserved for other purposes, and the seeds extracted. Processors wash the seeds and boil them for up to 24 hours. Then they use a pestle to work the seeds in a mortar containing sand, to peel the hull from the seeds. Finally, the seeds are thoroughly washed. Only after this process are the seeds ready to be made into soumbala. The actual making of soumbala is, by comparison, quite simple: prepared beans are boiled for about three hours, then strained and placed in a nylon or burlap sack and left to ferment for forty-eight to seventy-two hours. The resulting brown paste, which is dried in small pieces for later use in soups and sauces, is extremely pungent. Soumbala flavors meat, fish, and vegetable dishes as well as soups. These dishes define West African cuisine, but due to poor catches, weak harvests, or general poverty, they are not always an option for a large cross section of the population. In the past during times of scarcity, people depended on rice with soumbala’s proteins, fatty acids, and vitamins to sustain them. Today, the poor eat rice and nutrient-poor bouillon. Due to the labor-intensive nature of locust bean processing and the prevalence of artificially cheap cash crops, West African recipes and the soumbala recipe itself are changing. Bouillon cubes like Maggi are widely available and are sometimes preferred over soumbala for their uniformity and, depending on the region, their lower price. 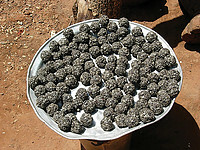 The quality of soumbala is generally high, but not all producers can ensure that it is free of sand or other impurities. Unfortunately, bouillon cubes contain none of the nutritional qualities of the authentic seasoning. Likewise, the dominance of subsidized soy across the globe is beginning to affect the soumbala market. Some producers have begun substituting soy beans for the local crop, often encouraged by development agencies. Despite the challenges to soumbala usage, the unique product is currently a source of economic innovation in West Africa. Entrepreneurs at all levels of society are looking for ways to profit by increasing access to soumbala. Traditionally, women produced soumbala for home consumption. Today, that tradition has gained economic significance as women entrepreneurs are carving out lives for themselves as producers and distributors of soumbala. The microfinance website kiva.org supports several groups and individual female soumbala entrepreneurs. Larger companies are taking on the challenges of producing a competitively priced, quality-assured soumbala, and others are trying to expand into international markets. These entrepreneurs are not only supporting themselves but also are protecting the environment by encouraging the cultivation of a sustainable, native species. Additionally, they are furthering a culinary tradition that could be lost without their efforts. Willa Campbell is a recent graduate of Grinnell College and a Cultural Survival intern.